Unlike Windows Server operating system, there is a shutdown/power button on Windows 10, 8 and 7 logon screen which lets you to shutdown the system without ever logging in. Sometimes you might have a shared / public computer where you want to prevent others from shutting down or restarting. In this tutorial we’ll show you two methods to remove the shutdown button from the login screen in Windows 10, 8 and 7. Press the Windows key + R to bring up the Run box. Type gpedit.msc and press Enter to open the Local Group Policy Editor. In left-side pane, navigate to Computer Configuration -> Windows Settings -> Security Settings -> Local Policies -> Security Options. In the right pane select the “Shutdown: Allow system to be shut down without having to log on” policy and double-click on it. Select Disable and click Apply and OK.
Now restart your computer. The shutdown button will disappear from your Windows login screen. In left-side pane, navigate to HKEY_LOCAL_MACHINE\SOFTWARE\Microsoft\Windows\CurrentVersion\Policies\System. That’s it! 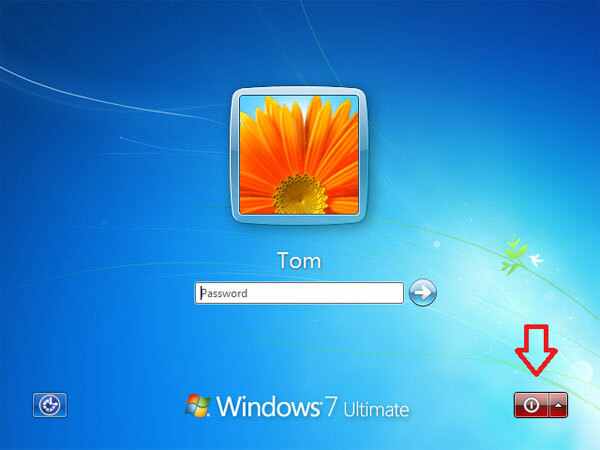 Reboot your PC to see logon screen without the shutdown button.